Teaching and Learning Music Made Easy. Saving teachers, parents & students time by providing amazing education material. 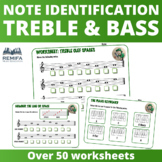 Treble and Bass Clef note identification worksheets. FREE Blank Music Paper - Larger spaces to make it easier to draw the notes. - No Clefs - Great for any age. - Use for your music studio or lessons. Follow and rate! Thank you for downloading! Happy Teaching. FREE Blank Music Paper - Larger spaces to make it easier to draw the notes. - Treble Clefs. - Great for any age. - Use for your music studio or lessons. Follow and rate! Thank you for downloading! Happy Teaching. Make your own reusable music 'whiteboard' '''''''''''''''''''''''''''''''''''''''''''''''''''''''''''''''''''''''''''''''''''''''''''''''''''' Great way for kids to draw on a reusable staff and practice notes names, chords and music more. Colour the Piano Keys and NotesFree sheet to sample future works. Please follow to be notified on new sheets. See preview for more. Both American and British English Spelling for Colour/ColorThanks for your support! 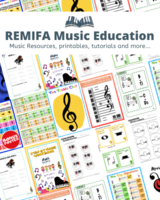 Ask REMIFA Music Education a question. They will receive an automated email and will return to answer you as soon as possible. Please Login to ask your question.